DR. JAIKUMAR SUNIL KUMAR was born on 1st Dec 1961 to W. Bro. Late. Dr. N. Jaikumar and Mrs.Santha Jaikumar. He had his early education in Loyola School and St. Josephs School, and Govt. Arts College, Trivandrum. He took his MBBS from Kasturba Medical College, Mangalore and MS General Surgery from Jawaharlal Nehru Medical College, Belgaum. He also secured the Post Graduate Degree of MBA in Hospital Administration.Dr. Sunil Kumar started his career as a Medical officer in Surgery Department at the Cosmopolitan Hospital Trivandrum where he is also a Share Holder. Dr. Sunil Kumar started his career as a Medical officer in Surgery Department at the Cosmopolitan Hospital Trivandrum where he is also a Share Holder. He also served the Medical Colleges of Calicut, Trivandrum, Thrissur– as Lecturer and Assistant Professor during 1993 to 2000.Dr. Sunil then moved on to Indira Gandhi Memorial Hospital, Rep.of Maldives where he was serving as Senior registrar, Consultant Surgeon, and Head of the Dept. of Accident & Emergency during 2000 to 2008. As a Senior Consultant Surgeon & Healthcare Consultant – International Medical & Diagnostic Centre, Rep. of Maldives (2008-2009) – he assisted an International business group in Maldives to start a multi-speciality hospital. He was assisted by my wife Mrs. Sunanda Sunil Kumar who worked with him as Administration Manager. Dr. Sunil Kumar is at present Professor of Surgery, Sree Mookambika Institute of Medical Sciences, Tamil Nadu, and a Visiting Surgeon to Republic of Maldives. DR. Sunil Kumar comes from a family of Freemasons. 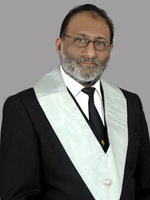 He was Initiated on the 19 of July 1997 by V. W. Bro. P. Sreekumar his own uncle. He was Passed on 20th September 1997 and Raised on 15 November 1997. He has held various offices in Lodge Trivandrum. Besides Lodge Trivandrum No.168, he is also a member of Mark Lodge Trivandrum No.125, Royal Arch Chapter Trivandrum No.125, Trustee of Lodge Sabaridesam and Founder of Mark Lodge Sabaridesam. He owns two consultancy services, Elankath Medical Services – Healthcare, Educational and HR consultant and Elankath Medtours – Medical Tourism consultant. W. Bro. J. Sunil Kumar is a member of the Association of Surgeons of India, life member of Indian Medical Association, life member of Kerala Govt. Medical College Teachers' Association, Honorary Fellow- IMA College of General Practitioners,Fellow of the Academy of General Education, Manipal and member of Indian Medical Association, Trivandrum. He is a member of Trivandrum Club, Trivandrum, Trivandrum Golf Club, Trivandrum, life member of Trivandrum Kennel Club and a life member of Operative Webmasons Guild. W. Bro. Sunil Kumar is married to Sunanda Sunil Kumar and their son Bro. Dr. Vishnu Sunil Jaikumar is a Veterinary Surgeon & Radiologist.